Indeed! That corner will never be the same! Thanks for the pic, David! And hey, if anyone has any neighborhood photos they’d like to share, drop us a line at [email protected]. 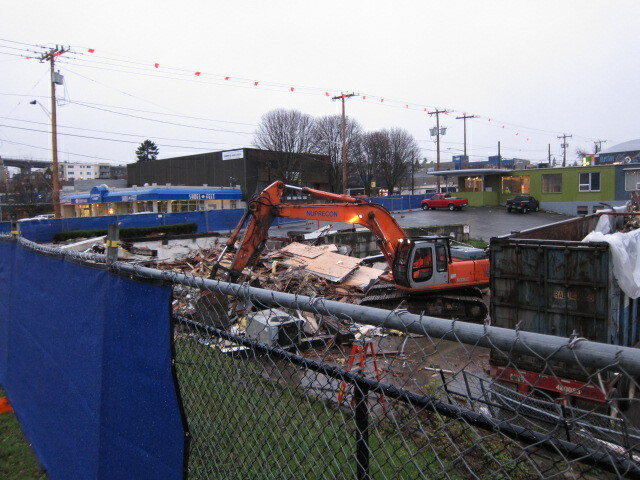 I can’t tell by the photo – was any of the demolition debris salvaged or recycled? How “green” is this phase of the project? No comment on Subway, but I love Tran Bros. The cream puffs, the pho! Than Bros is replacing the other Wallingford Subway; the one that was on 45th next to Swanson’s Shoe Repair.